Electrical Supply: What Are Non-metallic Conduits? An electrical conduit is a tube used to protect and route electrical wiring in a building or structure. It is generally installed by electricians at the site of installation of electrical equipment and its specifications are regulated by the US National Electrical Code (NEC). An electrical conduit is made of metal, plastic, fiber or fired clay. Most conduit is rigid, but it can be flexible as well. 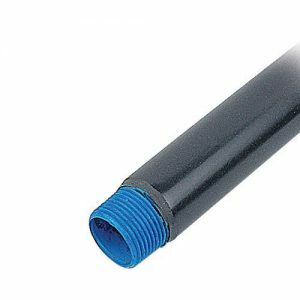 While metallic conduits serve to shield sensitive circuits from electromagnetic interference from enclosed power cables, non-metallic conduits resist corrosion and are lightweight, reducing labor and installation costs. Read on to find out more about different types of non-metallic conduits. PVC Conduit: this has been considered the lightest weight and lowest cost when compared to other types of conduits. In North America, it is available in three different wall thicknesses. The thin wall variety is suitable only for embedded use in concrete, while heavier grades are suitable for direct burial and exposed work. The various fittings made for metal conduit are also available in PVC form. PVC conduit is heated and bent in the field using special tools. These include joint to fittings that are made with slip-on solvent welded connections. These set rapidly after assembly and attain full strength in about one day. Since the slip fit sections do not need to be rotated during assembly, the special union fitting used with threaded conduit is not required. Because PVC conduit has a higher coefficient of thermal expansions that other types of conduit, it must be mounted to allow expansion and contraction. 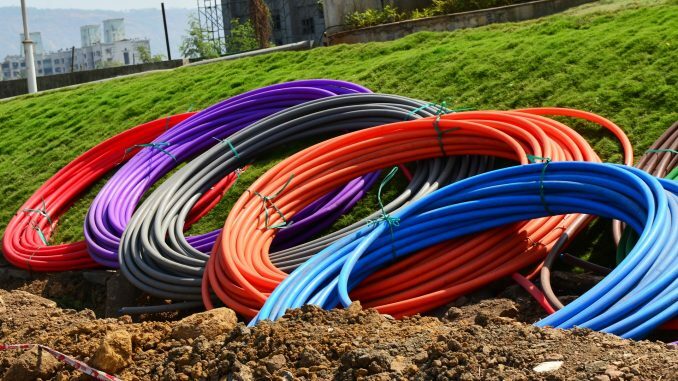 When installing PVC underground in multiple or parallel run configurations, proper methods should be executed to avoid deformation when heated, due to the mutual heating effect of densely packed cables. Fiberglass Reinforced Epoxy (FRE): Also known as reinforced thermosetting resin conduit (RTRC) or fiberglass conduit, this is a lightweight conduit as compared to a metallic conduit and also results in lower labor costs and, at times, lower labor costs. It can be used in a number of outdoor and indoor applications. It is available in multiple wall thicknesses and has a support distance that is very similar to steel. For specialty applications, including subway tunnels and station, zero halogen versions are available which meet NFPA 130 requirements in the U.S. A bonding conductor may be available for grounding. Joints are epoxy glued which requires a bit of extra installation labor time while waiting for them to set. The conduit may not be bent in the field and appropriate fittings must be used to change directions. Rigid Non-metallic Conduit (RNC): This is a non-metallic, unthreaded, smooth walled tubing. It has been used for several years in the United States, Canada, and Europe but has been under scrutiny for years due to the fact that it is made of combustible materials. Electrical Non-metallic Tubing (ENT): This is a thin-walled corrugated tubing that is moisture resistant and flame retardant. It is pliable and can be bent by hand. Installation is easy due to its flexible properties. It is not threaded due to its corrugated shape, although some fittings may be. Liquid-tight Flexible Non-metallic Conduit (LFNC): this refers to several types of flame resistant non-metallic tubing. It is recommended as a raceway for the installation of approved conductors with a nominal rating of 600V or less for non-hazardous locations. Interior surfaces can be smooth or corrugated. It is good to be familiar with the properties associated with the non-metallic conduit, so you know which are best to use in various applications. As compared with metallic conduits, the non-metallic counterparts are generally lower cost. They are also more resistant to corrosion. These factors contribute to the fact that they are becoming more popular in underground installations. If you are planning on working on the electrical wiring in a building or structure, it is a good idea to do some research on the various types of conduit. This way, you will be able to decide on the material that works best for you.